Sunday I preached on the story of the prophet Elijah and his protege Elisha from 2 Kings 2:8-14. Elijah knew he was nearing the the end of his life, and asked Elisha what he could do for him before he departed. Elisha replied that he wanted a “double-portion” of Elijah’s spirit. Of course, this is the Elijah who had defeated Ahab and Jezebel’s prophets of Baal, all 450 of them. This is the Elijah that had saved the widow of Zarephath and her son by assuring her that her flour and oil would not run out until God brought rain to end the drought. This is also the same Elijah who raised the widow’s son from the dead. So to ask for a “double-portion” of his spirit was to ask a lot. 1. To pick up the mantle of leadership, you have to want it. 2 Kings tells us there were 50 other prophets following Elijah, but Elisha was the only one to ask if he could inherit Elijah’s ministry. Of course, back in 1 Kings 19, God tells Elijah to select Elisha, and he does so by temporarily wrapping his mantle around Elisha’s shoulders. Elisha indicates that he wants this mantle of ministry by immediately ceasing to plow his fields, slaughtering his oxen, and building a sacrificial fire from the wooden plows and harnesses he is using. In short, Elisha wanted to pick up Elijah’s mantle. 2. To pick up the mantle of leadership, you have to wait for it. We don’t know how much time elapses between Elisha’s selection by Elijah in 1 Kings 19, and Elisha’s inheritance of Elijah’s mantle in 2 Kings 8. But, however long it took, Elisha had to wait for the time God had appointed for him to assume his prophetic ministry. When Elisha asked for a “double-portion” of Elijah’s spirit, what he was really asking for was that he would be seen as the rightful heir to Elijah’s prophetic work, just like a first-born son would have inherited the material possessions of his father. An heir has to wait to succeed his father, and Elisha waited patiently for God’s timing. 3. To pick up the mantle of leadership, you have to witness the power of God. 4. Once you have picked up the mantle of leadership, you have to wield it. As Elijah is being carried into heaven, his mantle slips from his shoulders. Elisha picks it up, rolls it up, and strikes the waters of the river Jordan, just as Elijah had done not long before. As he does so, Elisha asks, “Where now is the Lord, the God of Elijah?” By his action and his prayer, Elisha invokes the power and presence of God as he assumes the prophetic mantle. When Elisha strikes the waters of the Jordan River, the waters part just as they had for Elijah. Had Elisha not wielded the mantle of leadership, he would have never received confirmation that Elijah’s leadership had indeed passed to him. Leadership succession isn’t always neat or simple. 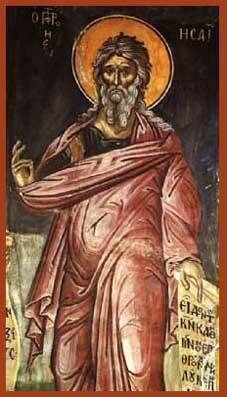 But church leaders can benefit from the lessons of Elisha’s succession to Elijah. By wanting to assume the leadership to which God has called them, by waiting until God’s timing is right, by witnessing the power of God in the transition, and by wielding the mantle of leadership once it has fallen to them, the transfer of leadership from one leader to another will follow an extraordinary biblical model. Normally, I don’t write about politics because it’s a sure way to alienate at least half of your readers. But I just read Wendell Griffen’s article titled, Obama Protects the Powerful Over the Poor. Griffen contends that President Obama needs a prophetic voice in his circle of advisers, one who will speak for the poor and the disenfranchised in our society. He critiques Obama’s calculated preference for the banks over homeowners, the powerful over the poor, and political expediency over the moral courage. Does the President need a prophet? Do pastors need a prophet to call us back to concern for society’s marginalized, especially in this economy? I thought the article deserved a mention here, and I hope you’ll take time to read it. Rev. Griffen’s sermons are also posted on EthicsDaily.com, and he’s a powerful preacher with a unique insight. If you don’t know Wendell Griffen, he was the first African-American appointed to the Arkansas Court of Appeals. Currently, Rev. Griffen is pastor of the New Millenium Church in Little Rock, Arkansas, and CEO of Griffen Strategic Consulting. I had the opportunity to spend an hour in conversation with Rev. Griffen last year. We talked about reconciliation and how to help communities come together by building what he calls “cultural competency.” Through Griffen Strategic Consulting, Griffen’s unique approach to racial reconciliation helps communities and corporations recognize the differences in diverse populations, but also finds common ground for cooperation and understanding. On another political note, if you’re tired of politics as usual, you might be interested in a non-partisan movement to select a presidential and vice-presidential candidate via the internet. AmericansElect.org is the first open presidential nominating process using the internet to tap into the growing disconnect between the two dominant political parties and regular folks. You may or may not be interested, but I find what they are trying to do a refreshing approach versus the two year-long primary process that has already begun. Visit the site because I think this is glimpse of the future of the American political process.